Thanks to all who attended our May 31 event! Mark your calendars now for next event on October 18. 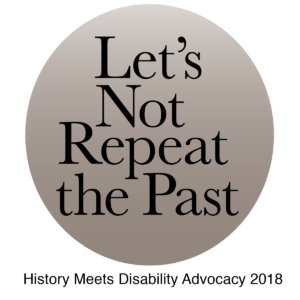 We’ll focus on Employment, Housing and Transportation through the lens of the same theme: Let’s Not Repeat the Past: History Meets Disability Advocacy 2018. This half-day event will discuss learning from the past—how the disability rights movement of the 1960s and 1970s informs present-day issues and advocacy. Watch for more details later this summer! Location: Rodef Shalom Temple 4905 5th Avenue Pittsburgh, PA 15213. Parking is available and the location is close to major bus lines. Accessibility accommodations will be available upon request. ASL interpreter will be provided. Funding for this event provided by the Edith L. Trees Charitable Trust.